We just posted a ton of pins! Whew! 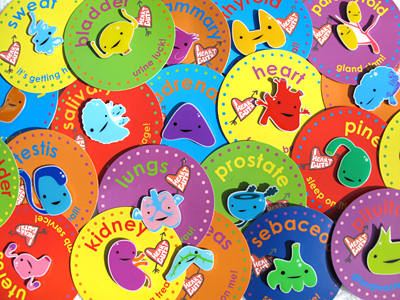 Every single gut and gland now comes in lapel pin form -- want a testicle pin? You can have it. We've even added a couple new gland friends -- the sebaceous gland (when clogged, these guys give us hated acne), and the sweat gland (for the exercise fiend in your life). We've got the entire metabolic team, from salivary glands to the thyroid, from the stomach to the intestine. Check 'em out.